Cline Rents offers a number of excavators with different buckets and attachments to meet your needs for excavating in Kenmore. 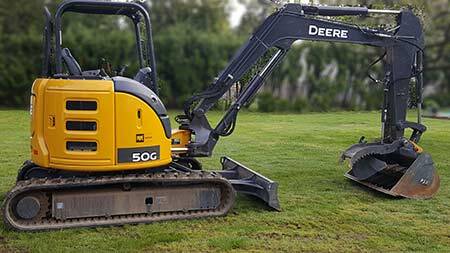 The use of excavators to dig holes and trenches can at times create situations that can lead to injuries. It is important to follow strict safety procedures when proceeding with a Kenmore excavator rental. At the same time it is good to know what the most common hazards are involving this type of equipment. For the most part our customers are not regularly involved in these situations. It is however important to familiarize yourself with them so as to avoid problems during your rental. Mobile equipment such as those found at construction sites, including excavators, are a particular hazard. Equipment operators do not always have clear lines of site for moving the gear. With trenches and grades dug by an excavator at a site, the possibility exists to put the machinery and thus the operator in a situation where it becomes unstable, posing a risk to the operator and any individuals that may be below grade. It is always best to have a flagger assisting the operator in repositioning the mobile equipment, excavator or otherwise. Any time a trench or cavity (such as a basement, foundation or swimming pool) is being excavated, there is the risk that the below grade environment can degrade and the atmosphere become lethal. Site operations personnel should make sure that any source of gases such as gas lines or engine exhaust is not close to the area. A common problem in below grade excavator cuts is the chance of materials falling into the cavity and injuring workers. It is not just materials either, instances of workers falling into the cavity and hurting themselves and workers in the cavity have been known to occur. It is best to install a barrier around the perimeter of the cavity to clearly mark it and make sure objects are kept at a safe distance. As already mentioned, OSHA has strict guidelines on reinforcing deep trenches. Even shallower trenches made by an excavator can pose a hazard however. It is important to make sure the walls of a trench are stable. You should know that stability can change due to continuous excavation or changing weather conditions; especially rain. Workers should not work alone in these situations. Many times in combination with excavation equipment we see people with the need for a dump trailer. It is great for loading and hauling debris and vegetation for smaller jobs. We do a good amount of dump trailer rentals in Kenmore, as you might expect. Check them out here.